Piercing the spring twilight dotted around the sky, no less than thirteen of these are currently visible, more than at any other time of year. However the window of opportunity in which to identify these stellar jewels rapidly diminishes as we head deeper into April, from little over an hour at the start, to just fifteen minutes by mid month. You will require clear views right around the horizon and complicating matters further, a number of planets may confuse the unwary. Let us assume it is late March (post clock change i.e BST time) or early April, at which time twilight deepens around 9pm. Our first port of call lies over in the west, where the mighty hunter; Orion, is about to lose his right toe, marked by bright Rigel, (1) below the horizon. . A word of caution before we go any further. Two naked eye planets are to be found low in the west late March/early April - Mars and Mercury. Mars will have a distinct orange hue, Mercury may be harder to spot depending on what date you observe, so if the 'star' you are looking at doesn't seem to fit the constellation, well done, you have also spotted two planets. Above Rigel, Orion’s three belt stars are aligned parallel to the west horizon, but the next star on our list, the conspicuous orange hue of Betelgeuse (3), is located above them. A hand span to the right of Betelgeuse and slightly closer to the horizon another orange star, Aldebaran (4) chief star in Taurus is visible in the ‘V’ of the Hyades cluster. Low in the WSW the brightest star in the sky – sparkling Sirius (5) should be quite unmistakable. Having picked out this first clutch of stars, there is no time to waste, so raise your gaze somewhat higher, to pick out the next wave of luminaries. Starting in the SW again seek out the bright solitary white hue of Procyon (6) in Canis Minor located above Sirius and to the left of Orion. Due west and higher still, Castor (7) and Pollux (8) denote the twins of Gemini, which is descending feet first down toward the horizon. At a similar altitude to Gemini further across in the WNW shines brilliant Capella (9) in Auriga, the only one of our bright seasonal winter stars not to set, being circumpolar from our latitude. Capella will spend the summer months arcing low above the north horizon and tricking the unwary into thinking it's the north star! 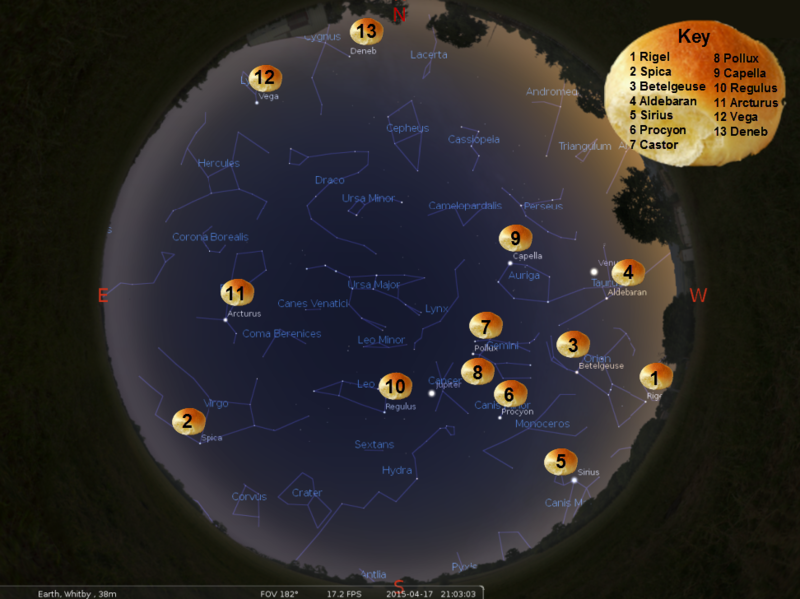 Turn and face due south, where midway up you will encounter bright Regulus (10) in the ‘sickle’ asterism of Leo. Our next two luminaries are located in the east. Due east, brilliant Arcturus (11) in the constellation of Bootes is very noticeable, its soft orange hue contrasting markedly with Sirius, the only star of the baker’s dozen brighter than it. Now for a test within a challenge, see how far into April you can spot both Sirius and Arcturus above the horizon at the same time! We still have three stars to locate, the first of which, Spica (2) chief star in Virgo, is just rising in the SE, so to spot it at the same time as the others a clear unobstructed view is required. Caution again- the very conspicuous 'star' above Spica is the planet Jupiter. So, having viewed west, south and east, direct your gaze toward the North, where low in the North-East brilliant steely blue Vega (12) resides in the constellation of Lyra. Vega almost rivals Arcturus in apparent magnitude, but unlike the ‘guardian of the bear” it is circumpolar from Whitby’s latitude and to the unwary also masquerades as the north star during the winter months. Our final star, Deneb (13) is located just above the NNE horizon and appears much less brilliant than Vega but is by far the most distant and massive of the stars visited. It too is circumpolar and along with Vega constitutes two of the three stars forming the ‘summer triangle’. In less than three months, only Arcturus, Capella, Deneb and Vega will remain of our original stellar baker’s dozen, the rest having set. So, are you up for a fun observing challenge? Have a go!